I have never really given much thought to special assistance provided at airports until now other than wondering if I could feign a broken foot to get upgraded to business (which never works anyway). However, this week I had to fly to Rome with a genuine injury. I’d sprained my ankle a few days before and it was still very painful to walk on. I went to check in my suitcase, so as at least to make it easier to walk through the airport, but was told at the check-in desk that I couldn’t as I had one of those cheapo tickets that allow hand luggage only. It would cost me an extra £40 each way to do so now. I explained my predicament. 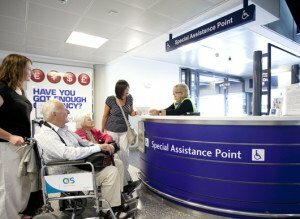 The BA assistant took pity on me, saying she could provide me with special assistance through Gatwick and also on the other side when we reached Rome airport. Within a few minutes, another smiling assistant arrived with a wheelchair and I hopped into it with my bags on top of me. Then off we went through the back doors, secret lifts and side passages that only staff and special people normally pass through. It did feel strange, more like being a VIP rather than an invalid. 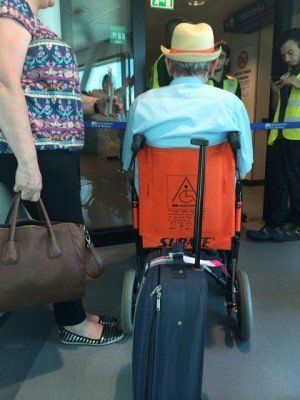 At security I didn’t even have to get out of the wheelchair but got body checked whilst still sat in the chair. This involved delicate touching including being patted on my underside legs and bottom through the underneath of the seat! I looked over to my smiley helper whilst this was all happening and noticed her struggling to put her winter boots back on. I thought it most odd that she was wearing knee length suede boots in the height of summer and so asked her. She replied that they were the most comfortable shoes she had and that she had even cut the metal decorative bits out of them so that she could get through the x-ray machines without triggering the alarm. I looked at them more closely and noticed the hand made holes on the front and back. But it did not always work and this time her holey but comfy boots had failed her. I understood her point given how many hundreds of times she has to go through the machines each week. Then off we went again, this time planeside, wending our way through the throngs of unsure passengers, headed for the special assistance hub. I felt really vulnerable all sat down and small, made worse by not being in control of which way to turn or when to slow down. When in a wheelchair you are not at the same level as your helper. They are always pushing behind you and so you have to crane your neck if you want to try to make any eye contact. Even then they are looking ahead in order to avoid all the people and obstacles coming their way. The special assistance area was full of people sitting and waiting. I often wondered why they needed a special pen since they are essentially sitting and waiting, just like everyone else. Why do they need to be segregated? Then it dawned on me – it is where all the scheduling takes place for who needs to be taken to which gate and at what time. A team of jolly ladies were huddled together behind a desk when we arrived, writing the passengers’ information down by hand onto paper sheets that looked a bit like the paper strips they used to use in air traffic control. 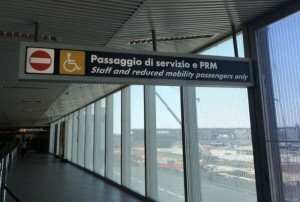 I marvelled at an old fashioned technology that seems to work wonderfully to manage the constant flow of passengers needing special assistance. When it was my turn to be dispatched my helper came to collect me and off we whizzed on another seemingly perilous journey. Most passengers are oblivious to everyone else – just concerned, and often nervous, about getting to their destination in unfamiliar territory. They simply don’t see people sat in wheelchairs. 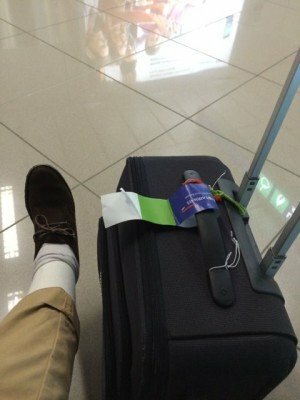 Several times our wheelchair got bumped unwittingly by trailing suitcases. I was terrified someone might accidentally barge into my ankle and kept bracing myself. When we landed at Rome airport, a row of helpers were all waiting standing next to a line of wheelchairs. My name was on their list and I was pushed up the ramp to the top of the gate by a sweet italian girl. But instead of being whizzed through I was promptly left as she returned to pick up more specials from the plane. I sat there, all by myself waiting, not knowing what was to happen next. I was reminded of the scene from Ricky Gervais’s “The Office” where wheelchair bound Brenda is left by herself in the emergency stairwell after David and Gareth abandon her during a fire drill. But thankfully, in my case, within five minutes my helper came back with a big smile and got me through to a taxi in no time at all. Everyone should have to sit in a wheelchair for a day to experience what it is like to be at the mercy of not-seeing others. It certainly opened my eyes to what they have to go through and I hope when I am mobile again that I will step aside, smile and be über patient with those who are in wheelchairs. But it is not just at airports. Wheelchair-bound people are also overlooked by others all over the place. For 20 years, up until the late 1990s, the UK’s Radio 4 ran a weekly series called “Does He Take Sugar?” that presented an in-depth treatment of disability. The title of the program refers to when the carer is asked about sugar instead of directly asking the person who is being offered a hot drink. It captures the sentiment of talking about someone who is disabled in the third person, while in their presence, regardless of whether that person can speak for him or herself. The programme brought attention to this kind of “overlooking” and gave disabled people a voice (it also had a disabled presenter). It did wonders for helping “abled” people realize how to listen, talk to, and engage with disabled people just like anyone else. The people whose job it is to provide special assistance or care for those with reduced mobility – as it is called now – are unquestionably guardian angels. It is the rest of us who cant see them for what they are who need to spend a day in a wheelchair to appreciate a little bit more what they have to go through every day. Hello, why not ask me? But to answer for myself I still have the ability.